This Week in Lebanon | Melissa Tabeek. Trash spills out of an open dumpster in Mar Mikhael, Beirut. Amidst the bombing this week on Tuesday in Beirut’s southern suburbs that killed four and injured more than 30 people, there were two other interesting stories happening this week that gained a lot of attention in the news. First, there was the trash stand-off, which resulted in massive piles of trash overflowing into the streets of Beirut. Then there was also the creation of the app, “I Am Alive,” by a Lebanese woman living in Paris that got a lot of attention as well. The trash issue is a long-standing one, but it’s one that I never paid much attention to until last week when I noticed the trash starting to mount. 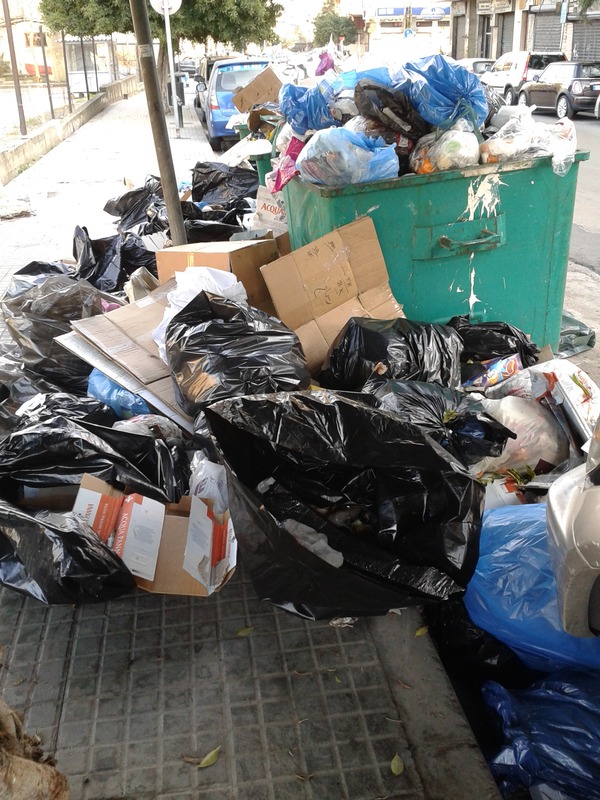 Open dumpsters can be found easily along the city streets, so when the trash is not taken out, it’s very easy to notice. This all came about because of the unaddressed grievances of activists in Naameh, who blocked the road where Sukleen, the private company that handles waste removal in Lebanon, dumps into the landfill. These activists have been blocking the road sporadically since January 17, demanding that the Naameh Landfill no longer be used. People who live near the landfill have been complaining to authorities for years about the smell, the environmental impact on the community and many believe that this toxic waste is making residents sick. Some residents also point to the landfill as a cause of the string of deaths due to cancer in the area as well. Yesterday, the protesters were cleared out by the police, but they have vowed to continue fighting – though they are suspending their demonstrations for now. One activist said that they will again take to the streets 15 days after a new government is formed. I’m no activist, but it really is sad to see the state of this country’s beautiful environment being destroyed. I’m rooting for the residents of Naameh. 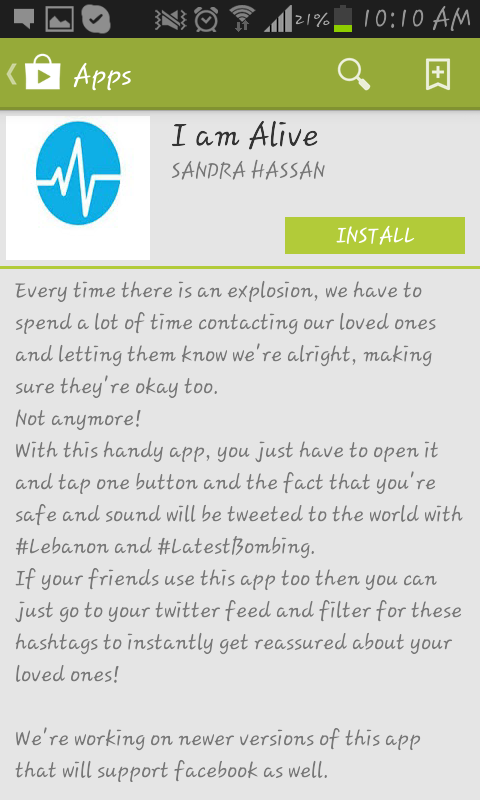 The “I Am Alive” app is really interesting story as well, and the attention it garnered to improve the app and make it a real tool that can be effectively used in Lebanon highlights an unfortunate fact that people here recognize that these string of bombings isn’t going to stop any time soon. Sandra Hassan, a 26-year-old student l in Paris, developed the app as a joke (dark humor). 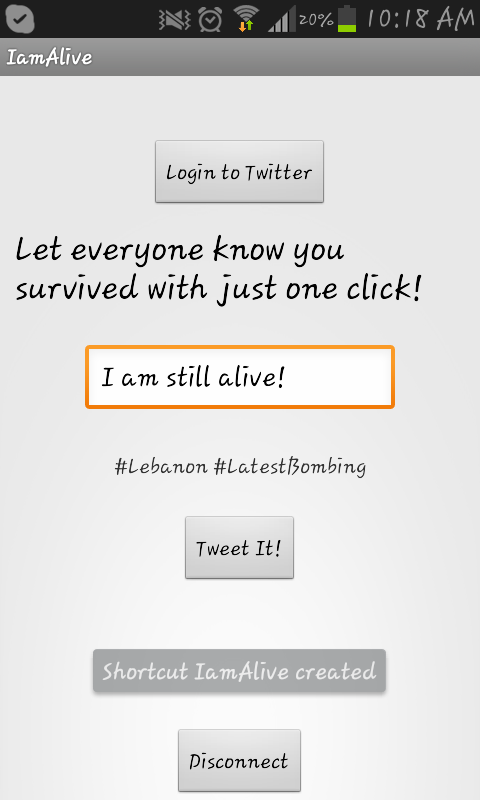 Providing an easy swipe and tweet solution to the problem of desperately trying to confirm that your friends and family are safe post-bombings, with one click, the app automatically tweets for you, “I am still alive!” with the hashtags #LatestBombing #Lebanon. Sadly, this is a great idea that has a market in the country. From apps to bombs to trash, Beirut this week continues to be a city where there is always something, somewhere, happening that captures the world’s attention. Getting rid of trash, where trash is dumped and the violence. Obvious priorities on addressing violence but trash in street may be protection for residents.